The previously top secret reusable reentry vehicle for the Soviet "Almaz" manned military space station will form the backbone of a major new U.S./Russian commercial venture to carry paying research crews on one week missions into Earth orbit by 2013. The EA management team includes some of NASA's most senior Apollo and space shuttle program managers, including George W.S. Abby and Jay Honeycutt, former directors of the Johnson and Kennedy Space Centers. Dula has also contracted with several international companies to help out. They include Space Flight Operations (SFO) a subsidiary of United Space Alliance in the United States; EADS Astrium Space Transportation in Europe; and Japan Manned Space Systems in Japan. 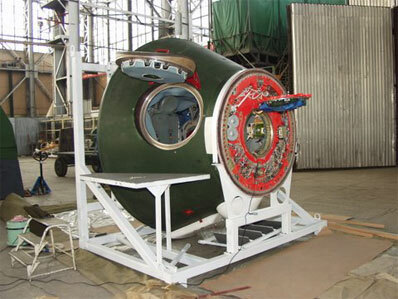 EA intends to begin flight tests of the Almaz hardware by 2012 and to launch its first revenue flight as early as 2013. Excalibur has raised "tens of millions of dollars" to initiate what will become a several hundred million dollar program, Dula tells Spaceflight Now. He has spent more than 20 years eying this specific Almaz program, something I can vouch for from my own experience with the Almaz program in Russia. He also says "the business plan closes" generating profits within a few years. His surveys have found research and science customers for space missions that are not tourist hops, but less demanding than ISS operations. The program is about to redo a science/industrial user study it did once in 2006. Dula says individual contacts already indicate there is a strong market for science and industrial missions that would not have to fly on the International Space Station and want to spend less time aloft than an ISS flight. Each mission will be piloted by an experienced cosmonaut or astronaut and can carry 2 researchers. The reusable Russian hardware purchased to initiate the venture was built more than 30 years ago as part of a large Soviet space reconnaissance program that was killed by the Soviets, much like its U.S. counterpoint was canceled by the U.S. Air Force. That Russian hardware will now be used to "open a new era of private orbital space flight for commercial customers, using updated elements of the Almaz space system," says Dula. He has over 30 years of experience as a Houston attorney specializing in commercial space, aerospace, export control and intellectual property law . He has also served as a Director and General Counsel for several aerospace companies, including Eagle Aerospace, Inc. and Space Services, Inc., which launched the first private U.S. space vehicle; and Spacehab, Inc., which built the Spacehab modules for the U.S. Space Shuttle. He also served as a Director and President of Space Commerce Corporation, the first US-Russian aerospace joint venture. His management team includes former U.S. astronaut Leroy Chiao as Executive Vice President for Technical Operations. Chiao has launched three times on the shuttle, and once on the Soyuz to the ISS where he has done six spacewalks in both U.S. and Russian space suits. Chiao also commanded the ISS Expedition 10 crew spending 6.5 months in space. He is now also a broadcast partner with Miles O'Brien for Spaceflight Now's highly successful shuttle prelaunch webcasts. "We have purposely been operating for the last few years under the radar because we did not want to be looked upon as some of these companies that later fizzle, but start out with fancy graphics about their credentials in 'New Space'," Chiao says. The project's primary technical partner in Russia is NPO Mashinostroyenia (pronounced machine-ah-st-roy-a-ya (NPROM). The highly regarded company which builds the reusable Almaz reentry vehicles also built the Almaz space stations that were at the heart of the military reconnaissance system. Somewhat resembling civilian Salyut stations, but with a far different mission, the Almaz stations were renamed Salyut 2, 3 and 5 as a covert cover and launched in the 1970s. Salyut 2 failed before any cosmonauts could be launched to it, but Salyut 3 and 5 were generally successful in demonstrating manned military space capability. Two more civilian Salyuts (6 and 7) were launched, before Mir's launch in 1986. In addition to buying several Almaz reentry vehicles, the company has also bought two complete Almaz space station hulls. It has no plans to outfit and launch the stations, however, until substantial business experience with the reentry vehicle mounted on a service module laboratory. The Soviet Almaz TKS reentry vehicle/service module design planned for commercialization is remarkably similar to the equally secret 1960s U.S. Air Force Manned Orbiting Laboratory (MOL) reconnaissance spacecraft. That system would have used a Gemini spacecraft with a hatch in its heat shield to enable American military astronauts to come and go between the Gemini and the laboratory module mounted underneath. The project was killed before it ever carried astronauts. But a Soviet version of the same concept got much further and several reusable Almaz crew reentry vehicles were flown and then reflown unmanned. The RRVs went through nine flight tests, with two RRVs were launched to orbit several times, demonstrating their reusability. One MOL Gemini was also flown twice, once on a suborbital mission to demonstrate its reusability at least for test purposes. The Gemini flown twice with a hatch in its heat shield is on display in the U.S. Air Force Space Museum at Cape Canaveral, while a Soviet Almaz reentry vehicle is on display in Washington at the Smithsonian National Air and Space Museum. 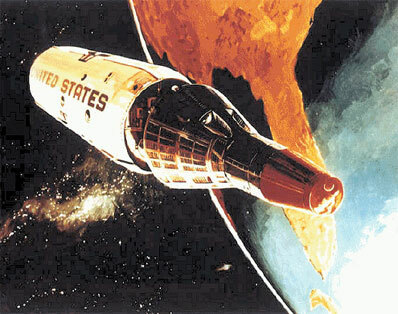 It is these reentry vehicles minus their own service modules that that have been purchased by the U.S. venture. The service modules on the Russian spacecraft varied in mission design, but some were like the FGB module on the ISS. Chiao said the service modules for the new program will be much lighter and high tech than the old Soviet designs. The Russians will build them, to whatever design EA wishes. And like the originals, all have hatches in their heat shields to allow the crew to move between the service module and bell shaped reentry vehicle. The long neck on each RRV carries attitude control propellant and thrusters as well as the deorbit rockets and three large parachutes. All of the key components of the spacecraft's recovery system have been certified and tested. This will reduce costs to EA, which will focus on installing new electronics, a more powerful environmental control system and the large new service module designs. The project hopes to begin flights by 2012-2013 possibly launching atop Russian Soyuz FB launchers with a Fregat upper stage capable of placing between 15,620 lb. and 17,160 lb. in orbit low Earth orbit. Other launch vehicles will also be compatible with the design, Chiao says. 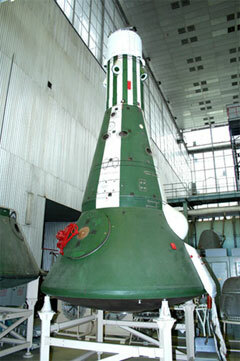 The several Almaz reentry vehicles were never launched or returned manned because of conflicts in the Russian space program between the military and civilian sides and between the more powerful Energia (that builds the single-use Soyuz) and NPROM that had the reusable Almaz - a major advance for the 1970s. In the late 1980s, when much of this program was still secret but the program cancelled, NPROM allowed this editor to visit their plant in Moscow and examine the full scale military hardware because, ironically, it was being discussed with Dula even then for a commercial role. At the time, we did not know about the reusability or even the crew capability of the large reentry vehicle. I was surprised when they told me to climb in - surprised to fined seats and an instrument panel - unused because of the Soyuz dispute. Then with great pride the NPROM managers chided me about what was the first truly reusable spacecraft. I bit, saying the space shuttle. They were ready for that one with a detailed presentation on their own fully reusable RRV fleet - now finally being purchased by Art Dula. One final full Almaz station had been outfitted with large imaging radar panels for commercial remote sensing programs. 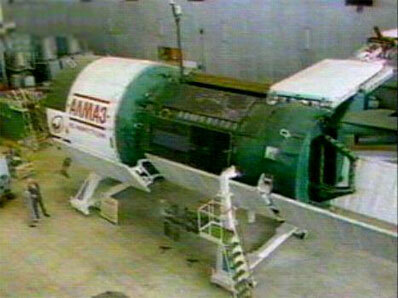 A genuine unmanned Almaz space station it was the largest remote sensing satellite ever launched. I flew with Russian air force and NPROM officials to Baikonur where we watched the launch of that Almaz radar spacecraft on a Proton heavy booster. We were only about 1.5 mi. away from the Proton pad - amazingly close for the explosive show every Proton delivers. Unfortunately, our communications line to the launch control center failed and there we were - rather close, but with no insight as to exactly when this night liftoff would take place. That was complicated by a long launch window and some technical delays that pushed T-O further into the window. A Soviet Colonel said he had a radio in his car about half a mile closer to the pad. He would signal us with his headlight at 1 min. then 15 sec. The signal light setup worked and the Proton then delivered on its good reputation. At the time, it was the largest pseudo-commercial spacecraft ever launched on a project that also involved Dula's hand.